Crunchy tortilla chips topped with buffalo chicken, homemade cheese sauce and your favorite toppings. It's a perfect game day snack! 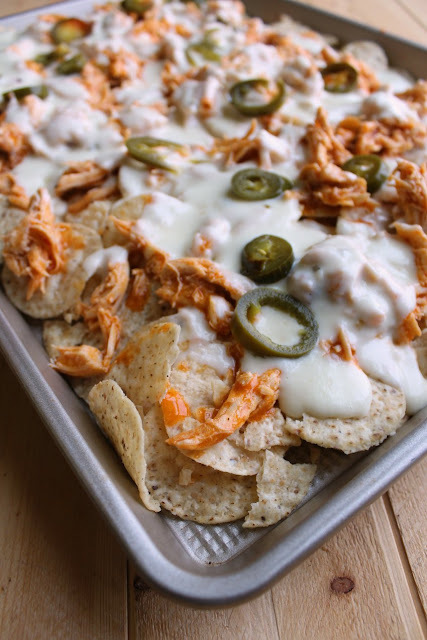 Buffalo chicken recipes are some of our favorites and these nachos are no exception. Get the chicken cooking so you can dig in by game time! You and your guests are going to be clammoring for more. It's that time of year again, the time when my brain starts thinking about hot wings, pulled pork, nachos and chili. The big game is right around the corner and I am struggling to pick a menu. I could go easy and pull out the hot dog roller. A nacho bar sounds great. Pulled pork on Hawaiian rolls is always good, but we did that last year. We had a few people over to watch the Steelers game on Saturday. What a spectacle. I am glad to see my team move on, but frustrated at the cost. Talk about a nail-biter at the end. Hopefully next week will be less of a roller-coaster. Either way, there will be good snacks. Like this one, combining two of my all-time favorite game foods. It has the spice of buffalo chicken, a creamy delicious homemade nacho cheese sauce, crunchy chips and a little extra pop from jalapenos. Mmmmm. We topped ours with some avocado and sour cream for good measure. Bleu cheese and green onions would have been great too, but I didn't care enough to venture out in the cold and ice to get them. It was great without them, but would be even better with! Mash and avocado until mostly smooth. 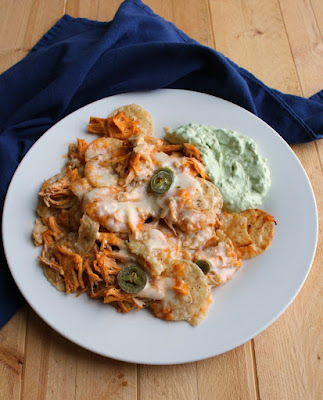 Dive in with buffalo chicken nachos to your heart's content! 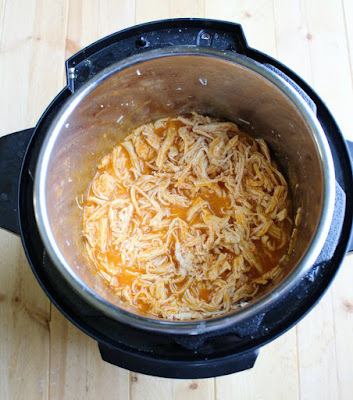 Toss shredded chicken and Buffalo sauce. If it seems too wet, cook it for a few minutes until the moisture content is down. You don't want soggy chips. In a saucepan over medium heat, melt butter. Whisk in flour and allow to cook for a couple of minutes. Slowly add milk, whisking the mixture as it is added. Continue to cook, stirring frequently until it starts to thicken. Stir in cheese and continue to cook until just melted and smooth. Remove from heat. Spread the chips in a large skillet or on a large rimmed baking sheet. Sprinkled with the Buffalo chicken mixture, then drizzle with the cheese sauce. Add jalapeno slices if desired. Place in the hot oven for 5-10 minutes. 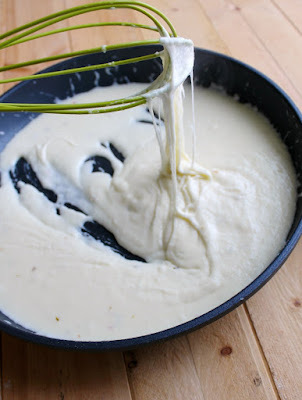 You don't want to brown it too much, just get everything extra toasty and the cheese should start to bubble slightly. Top with desired extras and enjoy while hot! Labels: apps and snacks, Chicken, Football! Mmm! I might make another batch for the playoffs this weekend! 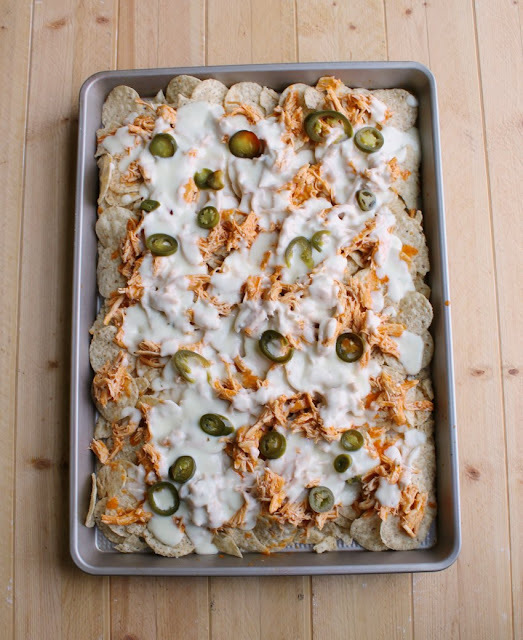 This recipe for buffalo chicken nachos sounds amazing! I'm planning a birthday gathering for my oldest son . . . and thought that a TACO BAR would be lots of fun. I'm thinking that this would make a great addition to the party. Thanks so much for sharing! My mom does taco bars for family dinner sometimes, and that is always one of the most popular menus! These nachos would be great with that! Between the waffle bar and taco bar, I htik your kids are pretty darn lucky! Thank you so much for stopping by. 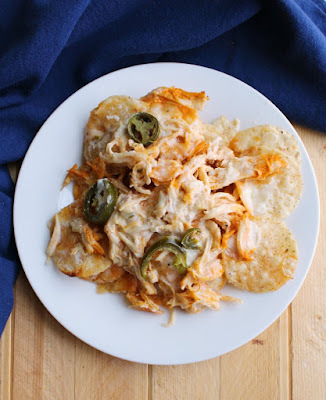 I love buffalo chicken pretty much any which way but it sounds especially delicious on top of nachos! Perfect football food :) Can't wait to give these a try! This could very easily be my downfall ;-) I hope you love them! Thanks for sharing on What's for Dinner! These look really, really yummy, and really really dangerous! I'd probably eat way more than my fair share! I know I did! Oops! You had me at nachos! I love any nacho dish around, and the fact that this one contains buffalo chicken makes me super happy! I will have to try these soon! Thanks for linking up with us at the #WednesdayShowcaseParty! Thanks for hosting! I love this combo, but am partial to any kind of nachos myself! Hi Carlee - it seems I've fallen behind on your blog, so I'm not stalking, just catching up!! This looks fantastic!! I sometimes forget about making nachos at home, but with all the games in full season, the timing couldn't be better! I will have to make this for next years football season! It's a perfect game time treat! PERFECT for the super bowl! I needed some new game day apps, thanks for sharing! These look delicious! I love nacho's, I am going to have to try these. Thanks for sharing your recipe. Thank you! Nachos are one of my favorites, but I don't allow myself to make them very often. Yummmm!!! How close are you to Wisconsin? My husband doesn't like anything with Buffalo Sauce so I tend to not enjoy it often. I'm probably a little over five hours from southern Wisconsin. My grandma grew up in Kenosha and she has the best stories and a very deep love of Wisconsin. I have gone "home" with her a handful of times. Are you far over the border with Illinois? Thank you so much! We love having pig outs at our house! OMG this looks delicious! I'm trying this out this weekend! thanks for sharing at #funtasticfriday! These sound so delicious!!! I'm craving some nachos now! Thank you! I wish I had more for lunch right now! Carlee, I am a nacho junkie, any and all types of nachos! Since I'm gluten free this is something I can whip up quick add salsa and guacamole and it's a treat. When I want comfort food this is what I whip up! I also love wings. So this is a match made in heaven. Great for game day, but I don't think I'll be able to wait, these are getting made! LOL Pinning! Ha! There are playoff games on today, so go ahead and make it! Do you just use cornstarch instead of flour to make a roux then? I have a hard time turning down buffalo chicken anything! These are perfect for game day! Me too! Especially when it makes it even easier to eat than an actual wing! We will just love your Buffalo Chicken Nachos. Hope you are having a great day and thanks so much for sharing with Full Plate Thursday. They were a fun treat combining our favorites! Thanks again! Yay! I absolutely love nachos (although I've never tried tossing avocado on, can't wait to try that)! Thanks so much for sharing at Merry Monday! I think the avocado adds that extra little creaminess (and of course deliciousness!) Thanks for stopping by! Ooo these look so yummy Carlee - my husband and I love nachos, excellent idea going Buffalo style of course ;). Pinning and sharing! Thank you! Nachos and Buffalo sauce are two of my favorite savory guilty pleasures!